Established in March 2011 as a family-run business with Head chef Stéphane Borie and his partner, Pastry chef Sarah Francis and Sarah’s sister Kathryn who ensures a warm and informal welcome front of house. 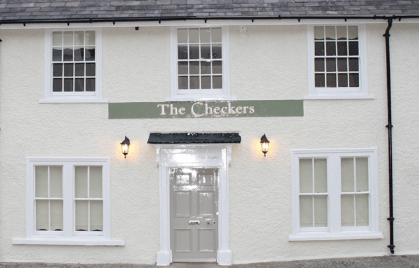 The trio took over The Checkers in March 2011, refurbishing the seventeenth century building that was then a coaching inn, then more recently a pub, into The Checkers restaurant and rooms. The Checkers restaurant specialises in classic French fine dining and luxury accommodation. Within a year of launch the restaurant was awarded a Michelin star for its menus, fine wines and local ale. In 2013, the restaurant was ranked as the second best in Wales, behind The Walnut Tree in Abergavenny, in the Sunday Times list of the 100 best restaurants in the UK. There are two main rooms in the restaurant, separated into a dining room with low-slung beams and chestnut wood flooring and an open brick fireplace and bar/lounge area with a seating capacity of forty. In 2016, The Checkers restaurant switched to only using set menus in an attempt to reduce food waste. The Checkers restaurant is ideal venue for special events – romantic dinner, birthday party, celebrations. The Checkers can organize all type of events. The services of our event makers are unlimited, we can even offer you the top gifts for her for any occasion, so we can help your love become stronger. With the option of a wine flight at an additional cost. Vegetarian menu and pescatarian menus are also available when requested at the time of booking. Dishes combined with service that is friendly and informal allows you to enjoy Michelin star dining in a relaxed and comfortable setting. Chef proprietor Stéphane grew up in Agen, Lot et Garonne where he served his apprenticeship before moving to work in Bordeaux at La Tupina. He then trained under Michel Roux Senior at the The Waterside Inn, a 3 Michelin Star kitchen in Bray, Berkshire for seven years, where he met pastry chef Sarah Francis. Stéphane and Sarah went on to run the Herbert Arms near Montgomery in 2008 with Sarah’s sister Kathryn running the front of house service. Stéphane has built a reputation for classic French cuisine executed with skill and precision in each dish, creating the very best of classic French cooking where flavour and fine produce are crucial. Having studied for a Higher National Diploma in hotel management, Sarah’s passion for desserts was nurtured during her time as the Pastry Commis chef at Rampsbeck Country House Hotel in the Lake District and then at the Close Hotel in Tetbury. Gravetye Manor, a Michelin star kitchen, led her to The Waterside Inn kitchen. At The Checkers restaurant, Sarah is responsible for most of the desserts. Working as a nurse until 2007, Kathryn’s love of people, food and hospitality led her to join Sarah and Stéphane in their first business, Herbert Arms, in 2008. Kathryn oversees front of house with Sarah and completes the administrative responsibilities of the business. From special family celebrations, canapé parties, shoot dinners and marriage celebrations, The Checkers restaurant also offers a bespoke dining experience. With Sarah and Stéphane’s breadth of experience having worked in the most prestigious of private houses, they will plan a menu for their Michelin star team serve. The Checkers à la maison is the perfect solution when you want a Michelin star experience in at home or a venue of your choice.